The cute Bowlingual translator, which purports to tell you what your dog is saying, has been updated to present vocalization. So now, you know what your dog is trying to say - in Japanese. 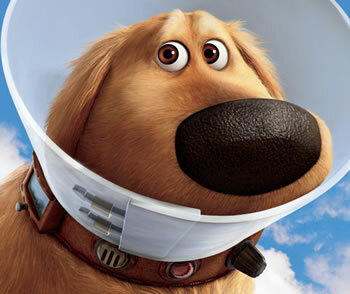 Fans of the recent movie Up see the very cute translator collar for the dogs - Dug is wearing one below, along with the humiliating "Cone of Shame". It translates dog speech as well - into a variety of languages. I was wracking my brain to figure out where I had seen this before - and I found it! Murray Leinster wrote an absolutely splendid 1947 story called Propagandist about aliens who needed to know what human beings were really like. They used a psychoscanner on a dog, Buck, who had been inadvertently left behind after his master departed. Psychoscanners have been able to secure excellent pictures and sound memories from the animal. It is of a species that lives in symbiosis with the creatures operating the space craft. Its utility to the superior race is not yet clear... Apparently, however, little or no technical information can be had from the animal because of the disinterest of "Buck" - this is the auditory memory of the animal's name for itself - in such matters. From Oh Gizmo! and Gizmodo; thanks to Zac Hunter for the tip on the story.